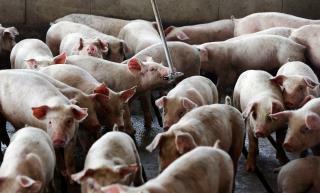 (Newser) – A low-cost, high-volume livestock-rearing method pioneered in North Carolina came under fire Tuesday as jurors began hearing a lawsuit from neighbors who say the world's largest pork corporation is endangering their health and making their lives miserable. The legal action is the first in a string of federal lawsuits against the hog-production division of Virginia-based Smithfield Foods, reports the AP. In dozens of lawsuits, more than 500 neighbors say that for decades they have suffered headaches, sinus problems and intense, putrid smells that can't be removed from clothing or household fabrics. "Smithfield has never done anything to change," lawyer Michael Kaeske told jurors. "They're not going to do anything to change unless you make them." The suit heard Tuesday pits Smithfield against 10 neighbors of a farm raising 15,000 hogs under contract with the pork giant. Kinlaw Farm and its owners are not defendants. Instead, the suit targets Smithfield, which determines the farm's operating standards. "Smithfield controls what the growers do and they don't have the money to do anything different," Kaeske said. Since pork producers began dramatically consolidating in the 1980s, sprawling operations holding thousands of hogs generating a small city's worth of urine and feces each day have become standard in North Carolina. The excrement is flushed into pits where it is broken down and then sprayed through a type of agricultural water cannon as fertilizer onto nearby fields. DNA tests found a bacteria originating in swine digestive systems coating the homes of all 10 plaintiffs, Kaeske told jurors. Though less-malodorous technologies have been developed and applied at Smithfield operations elsewhere, North Carolina operations haven't changed, Kaeske said. "They continue to spray feces and urine near their neighbors." Libs and dems and vegans need to thank drumph for his war with Gina. North Carolina pig farms will suffer under drumphs war.